Today is the Feast of Saint Ignatius of Antioch, Bishop and Martyr. This Bishop of Antioch, like St. Polycarp, was a disciple of St. John the Apostle. St. Ignatius was the third successor of St. Peter at Antioch; a tradition says that he was held on the knee of Our Lord when the Savior spoke the words “Suffer the little children to come unto Me.” During the persecution of Trajan he was condemned to death and sent in chains to Rome. While on the way he wrote letters to various churches which are precious documents for our Faith. He rejoiced when he heard the roaring of the lions set loose to devour him, exclaiming: “I am the wheat of Christ: may I be ground by the fangs of wild beasts and become bread agreeable to my Lord!” He died a noble martyr in Rome on October 17 around 107 A.D. He is commemorated every day in the prayer which precedes the Pater Noster, known as the “Great Intercession” – the Nobis quoque peccatoribus. Lesson from the Epistle of blessed Paul the Apostle to the Romans. Brethren, who shall separate us from the love of Christ? shall tribulation? or distress? or famine? or nakedness? or danger? or persecution or the sword? (As it is written, for Thy sake we are put to death all the day long: we are accounted as sheep for the slaughter.) But in all these things we overcome because of Him that hath loved us. For I am sure that neither death, nor life, nor angels, nor principalities, nor powers, nor things present, nor things to come, nor might, nor height, nor depth, nor any other creature shall be able to separate us from the love of God, which is in Christ Jesus our Lord. Behold, a great priest, who in his days pleased God. V. There was not any found like to him, who kept the law of the Most High. 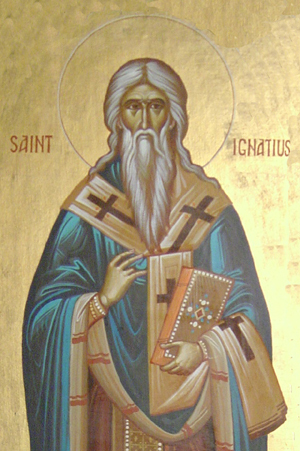 Have regard to our weakness, O almighty God, and since the burden of our deeds id grievous to us, grant that the glorious intercession of blessed Ignatius Thy martyr and bishop may protect us. Through our Lord Jesus Christ Thy Son. Who liveth and reigneth with Thee in the unity of the Holy Ghost, one God Forever and ever. R.Amen. I am Christ’s corn; let me be ground by the teeth of beasts, that I may be made into pure bread. Refreshed by the participation in the holy gift, we beseech Thee, O Lord our God, that by the intercession of blessed Ignatius Thy martyr and bishop, we may experience the effect of that which we celebrate. Through our Lord Jesus Christ, Who livest and reignest, with God the Father, in the unity of the Holy Ghost, one God For ever and ever. R. Amen.